Construction of the Purple Line is now 10 percent complete, according to project leaders who provided an update Thursday before the Montgomery County Council's transportation committee. Construction began in August 2017 but it had been scheduled to get underway long before that. It was delayed as Maryland transportation officials successfully fought a federal lawsuit that had been filed by project opponents. The Bethesda-to-New Carrollton rail line hits a milestone. Project leaders would not specify Thursday how much money the delays would ultimately add to the light-rail line’s cost, but there have been reports that the figure could be well over $200 million. “I don’t know exactly how much those costs are at this point,” said Charles Lattuca who represents the Maryland Transit Administration. Maryland transportation officials will need to reach an agreement on that with Purple Line Transit Partners, which has a public-private partnership with the state. “If we can’t reach a settlement then we might have to go into litigation over it,” Lattuca said. When completed, the 16-mile Purple Line will have 21 stations between New Carrollton and Bethesda. The original opening date was scheduled for March 2022 but that was pushed to October 2022 because of the lawsuit. 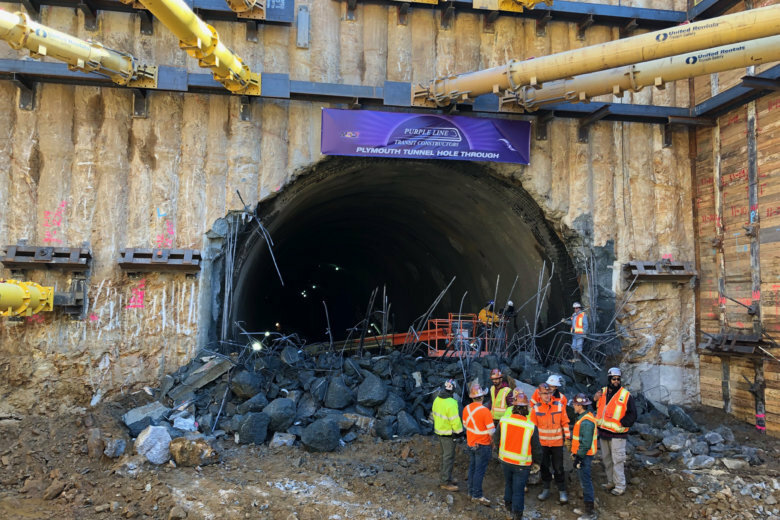 Purple Line Transit Partners has indicated that the opening date could end up being in 2023, although both sides said they are still pushing for an opening sometime in late 2022. “We won’t know all the costs until these issues are resolved,” Lattuca said. Noise complaints were also part of the conversation at Thursday’s committee meeting. People in the Long Branch area, east of downtown Silver Spring, have said that Purple Line work at the Plymouth Street tunnel has been disrupting their lives. Craig told committee members that excavation has been completed on the tunnel and that the noise would no longer be a problem.